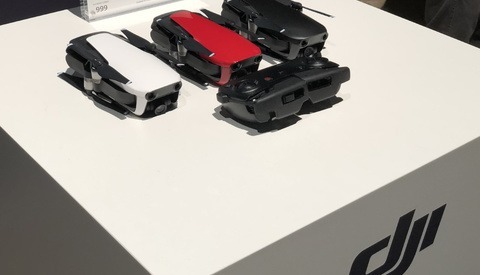 After the release of the new DJI Spark and its ability to fly without a remote, it is believed that DJI has the technology for anybody to fly. Steve Kampff and I decided to put this concept to the test comparing DJI's Intelligent Flight Modes to the Manual Capabilities of the user. In this video, we see that flying can be pretty challenging, but DJI definitely steps up to the plate allowing users to achieve more complex shots with little to no skill or experience. I have been flying for almost a solid two years now, shooting and filming almost everything one can imagine. During all that time, I was never able to use DJI's Intelligent Flight Modes because I did not have them on my drone at the time. That being said, I felt like I had to learn how to do all of these movements myself and would practice them every time I was out flying. I always felt it was better to rely on myself rather than rely on the technology to get the shots I wanted. When I finally got my Inspire 2, I was able to try some of the modes out, but still felt a lot more comfortable doing them all manually because I was so used to it. For me, it is a preference to fly manually when I shoot. As a beginner to one of the newer drones, the DJI Mavic, Steve uses the flight modes all the time and claims that they are great to have. When he explained why they were so good for him, I realized that DJI is doing something very beneficial for their consumer market. While it took me over a year of practice to finally execute some of my shots, Steve is able to achieve the same types of shots within a few seconds on the DJI app by just telling it what to do, setting the speed, and pressing record. While we were talking about all this, we came up with the idea to compare Man (Steve and I) versus Drone (Intelligent Flight Modes). The two main modes we tested were POI and Active Track, both involving some sort of a subject to follow or rotate around. After doing this almost every day when I shoot real estate, I have to say that I was impressed with the results of the Intelligent Flight Modes. 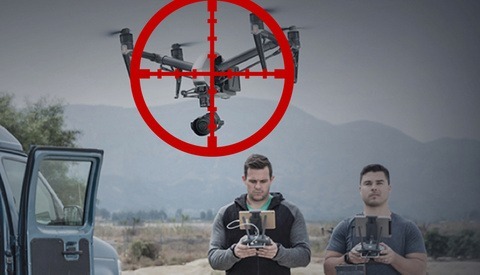 Point of Interest is simply a type of shot where the drone revolves around an object. 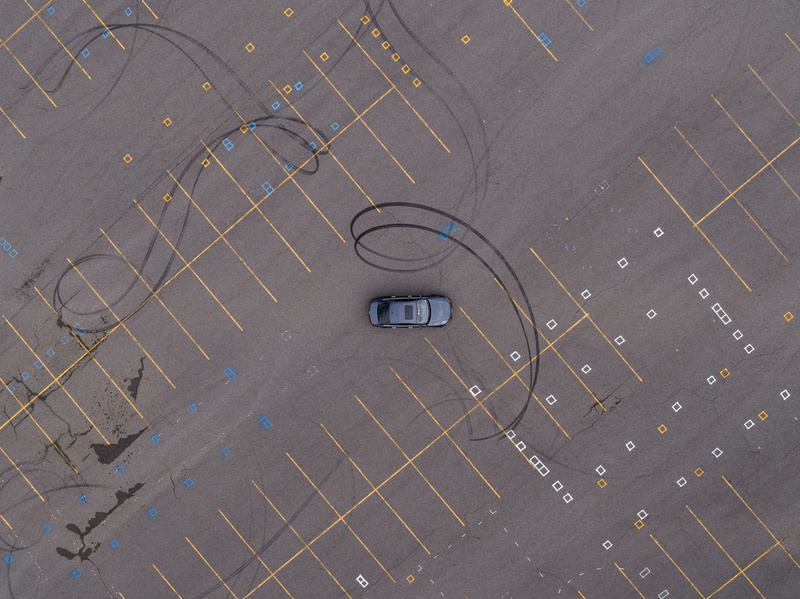 For this test, we decided to use my car and park it in the middle of the parking lot so there was plenty of open space for the drones to fly without hitting anything. If you are asking yourself if we made the skid marks, unfortunately, you will never know. For the first go at this, Steve programmed the Mavic to circle my car, while it did an okay job up close, we pulled the drone back a bit and slowed down the speed, noticing a huge difference in how good it did getting the shot. When the drone was too close to the subject, it was a bit choppy flying around it, but once it is back at a reasonable distance circling a still object, it had no problem circling the car. After we tested DJI's technology, it was my turn to go against it by flying completely manual. I shot first with the Inspire 2 and then had my first flight on the Mavic trying that manually too. Of course, it was a lot harder for me since I had never flown the Mavic before, but I did the best I could to get the smoothest shot. In the end, we agreed that POI takes the win. While I was able to control the drone fine, it took me a long time to get used to making those subtle thumb movements to navigate the drone in that way. That being said, DJI allows anybody to be able to be able to do this by offering this mode. These shots are pretty much as close as you can get to what a professional user can get and you can definitely rely on them for certain shots. 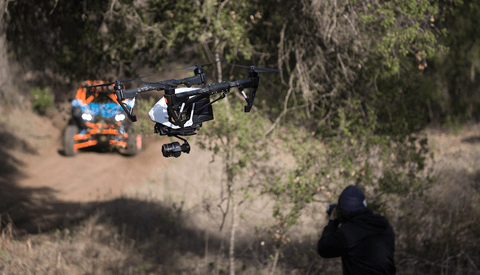 Active Track is another popular feature DJI offers, allowing you to track, follow, and even rotate around your subject as it is moving. These shots can create awesome movement in your videos if they are smooth and done right. First up was Steve with Active Track on the Mavic as I rode the longboard down the lot. Active Track had no problem keeping up with me as I was riding but when it came time for Steve to go against the technology of his own drone, he struggled a little bit keeping me centered in the frame. When it was my turn to fly the Mavic manually, I was able to keep Steve centered in frame, but noticed that I had a little more trouble following him from behind as the drone would slowly drift to the side. After this test, we also agreed that Active Track takes the lead. Again, while a more experienced pilot can frame and fly just fine, it takes a lot of practice or multiple tries to get the shot just right. So, DJI does it again with another win in their technology. While this doesn't necessarily fit into the testing we were doing, I thought I would give Steve a bit of a challenge. With the ability to change lenses on the Inspire 2, I threw on the 45mm which converts to a 90mm on a full frame. 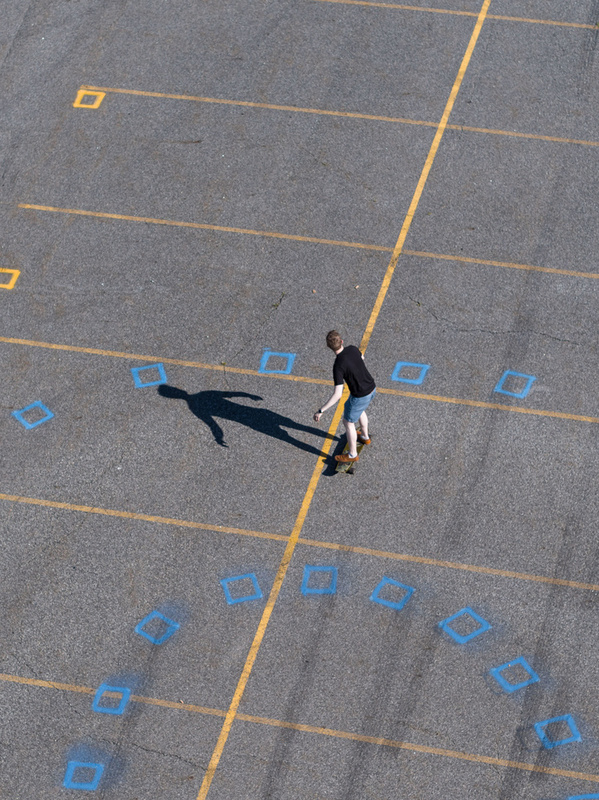 This time it was Steve tracking me walking on a telephoto lens with no Active Tracking. Flying this lens and creating smooth shots is one of the harder things to do, so we thought it would be funny to compare somebody who is used to flying this lens to somebody who has never even tried flying an Inspire in general. As much as Steve struggled with it, I think he did a pretty good job for his first time ever flying an Inspire, let alone flying it with a 90mm lens attached. While we only really tested the modes on the Mavic, it is safe to say that consumer drones do have what it takes to create professional looking drone movements. That being said, these modes are great to use as a beginner until the user is ready to practice them manually and learn to master them. Many people buying consumer drones like the Spark or Mavic may not even be looking to create cinematic/professional movements like this, but the fact that DJI's technology offers it goes to show that these drones are made for anyone to fly and it can always assure that a consumer can create an awesome video themselves. When it comes to the bigger drones like the Inspire 2, I think it is great to have the modes available if you want to use them or get used to using them to help out if needed. For the most part, I prefer to fly completely manual and feel that anyone doing commercial work would feel the same way in case this technology was not working, we would still need to be able to achieve the same shots. I would encourage everybody to use the flight modes on their drones, especially if they are not so interested in droning or creating perfect cinematic style shots. Learning these movements takes time, patience, and a lot of practice, but when you learn to do it on your own, the drone has even more capabilities than you can imagine. The technology DJI offers is there to help everyone fly. 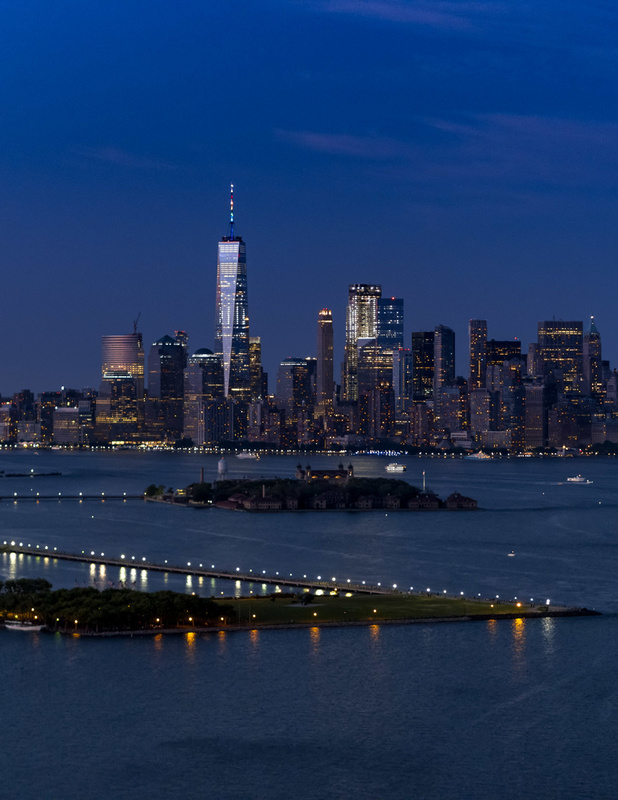 After all of this, we headed out to Bayonne where we found some open airspace to get a few shots of the N.Y.C. skyline with our drones. Overall, it was a great day to put Man to the test and see that the technology in drones is advancing to the point where we pretty much don't even need a controller to use them unless we want to fly and control them ourselves. fantastic video and writeup guys. And wow, your editing is top notch.